Nonsense. The magic, world-hoppy, sword-fighty kind. 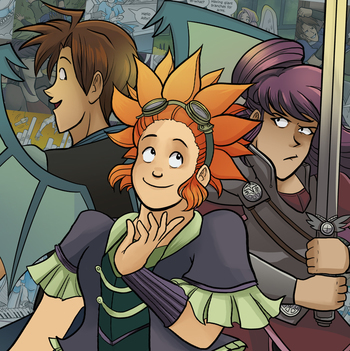 Sombulus is a humorous fantasy adventure webcomic by Christina Major following a zealous paladin, flippant energy harvester, and curious spiky haired tinkerer. They set off on fantastic adventures through the strange, surreal, magical and mystery-riddled Myriad Worlds, leaving each place a little more weird than the last. Our Angels Are Different: The Kanites are all feathery-winged people and are supposedly representatives of God, but their morals seem questionable at times. Our Demons Are Different: The Demshul sport bat-like wings and love to use magic, which the Kanites regard as evil and against God's will. Spiky Hair: Rana's hair is big, red, and naturally spiky. The Paladin: Sydney Treuno introduces herself as a Paladin of the Order of Kansen on a god-given mission to defend the Myriad Worlds from evil. No One Should Survive That: It's been 700 years and the King just wants to die, but so far he's not been lucky. A lot of his assassination attempts sum up to this.